I still have made little progress on anything. The pastime that was once my stress release has been pushed to the side. Other things manage to override my knitting. 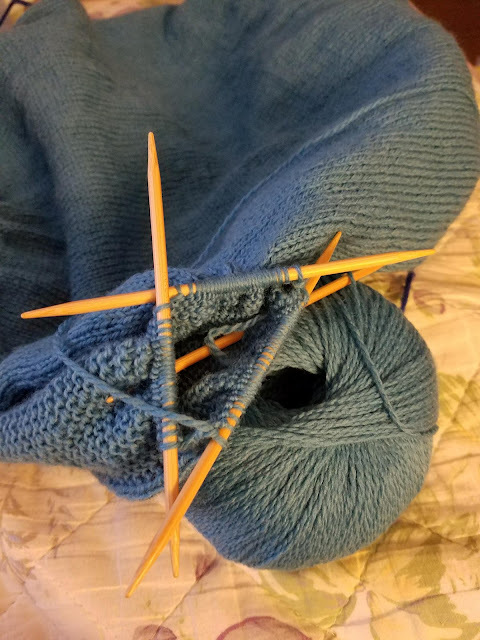 But, I started back on the second blue sweater. I started on the first sleeve. I had been knitting on my Boxy, and untangling the other half of the skein. The yarn is Oceania, and it has 1440 yards in it. That is an entire sweater. Or almost. I had to cut it, as my ball winder would not hold all of it, and it was severely tangled. Not anymore. Over this past week, working on it a bit here and a bit there (mostly at night while watching Netflix), I was able to untangle it all. I have about 9 inches of the 22.5 that I need. Almost halfway there. Noticing the "almost" trend? Yeah, me too.